Some people are doers. They don't ask questions--they see a need and jump in to fill it. Phyllis, while teaching full-time herself, was one of a couple of people who consistently checked on us, showed up with dinners, or with a cleaning caddy... announcing she was there to clean bathrooms or whatever else we needed. No questions--just action. My oldest daughter-in-law's sister is another doer. Seeing the recent need from Hurricanes Irma and Harvey, she's rallied her friends and church family in California to donate items and help people they'll probably never meet. I’m sure you also know some people like this. We need the doers! Less talk and more action. You know who else is a doer? GOD. While it may be difficult to see at times, He is constantly working on your behalf. During deployment, it may not feel like He is working. You may not see Him working. You may struggle with doubt and wonder if He even sees your situation. Especially if your spouse is in a dangerous place, it can be difficult to understand what His plan is for you and your family. When you see your kids worried and struggling, when you can't sleep for the worry, you can wonder how any of this is part of His good plan for you. I don’t have the answers for your situation. If you’ve been in the military life long enough, you know that there are no guarantees. No outcome is assured. While this is depressing if we dwell on it long enough, there are some things guaranteed. God’s love. His care for you. His presence. 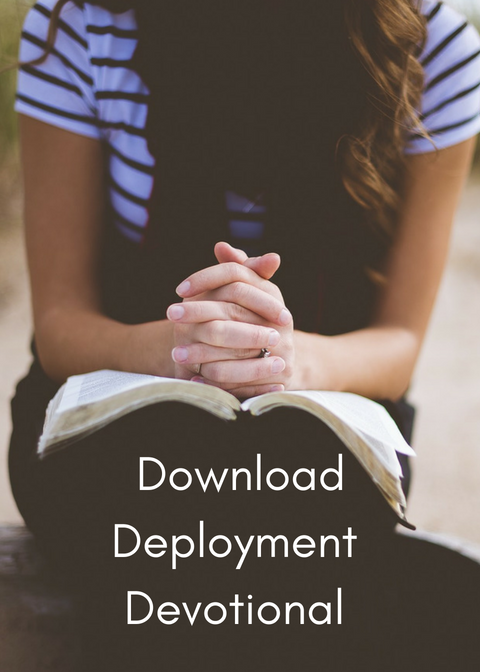 I've shared before 15 Bible verses for military spouses facing deployment or separation. But today, let's talk about God's promises. There are so many! Our church is currently working through Max Lucado's new study, Unshakable Hope. Each week, we look at a promise of God and make a point to study and dwell on it. I thought it would be a good idea to look at a few promises from the Bible that especially apply to military spouses. I know when I'm struggling or doubting, God knows. And I also know that I need to keep the truth in front of me, to learn it so I have something to cling to during the dark moments. 1) God will give you strength when you feel like you can't go on. 3) God cares about you. 4) God has not forgotten you. 5) God will never leave you. What's your favorite Scripture or promise of God when your spouse is deployed? Please share in the comments! We respect your privacy. I'll never spam you.